We lived next door to Cece for 15 years in an older neighborhood with huge trees, big yards and single stall garages. It was our first house. And it was their first house. Cece and Bob, her husband, moved into the neighborhood in the 1940’s. It was full of young families and lots of children. They had one child, also named Bob. 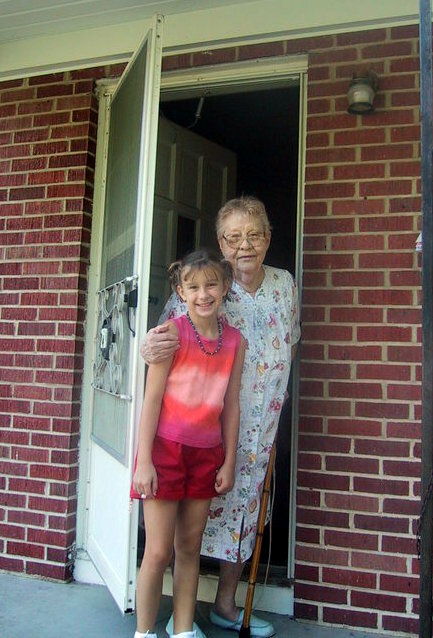 Over 60-some years, Cece saw all but a few neighbors raise their children, grow old, move to nursing homes and pass away. We moved into the neighborhood in the 1990’s. By then the neighborhood was sprinkled with a few of those that had lived long enough, like Cece and Bob, some young couples, new families and single people that were just starting out. “Starter homes”, they were called, small 2 bedroom houses with detached garages. We had no idea that we would stay for 15 years, and mostly because of Cece. In the early months, most of our conversation with Cece and Bob was brief, in our front yards, from car to house. Joe and Bob chatted a bit when doing yard work. One of the first things Cece said to us was, “Your leaves are falling on my yard!” I’m pretty sure she enjoyed our shade :), but the leaves from our big oak tree drove her crazy. So it was a surprise one day that Cece knocked on our door. “Bob can’t breathe”. Both Joe and I ran next door. It was the first time we had been inside their house and Bob was dying of a heart attack. “Don’t call an ambulance”, he said. Joe spent a few minutes trying to put on his shoes and I called for an ambulance anyway. Bob was taken by ambulance and Joe drove Cece to the hospital, this neighbor we hardly knew. Her life changed that day. Bob died within minutes of arriving at the hospital and Joe brought Cece back home, a widow. Our life changed that day too. Cece became part of our family and we became part of hers. We had Thanksgiving breakfast together every year. And 4th of July fireworks in front of our houses while eating root beer floats that my mom brought over. She made extra soup and sent us the leftovers; bought us goodies at the store, always had a stash of dog treats and made our favorite dishes when we got extra busy or sick. Our dogs became “the babies” and she would ask for them to come over for a visit. We opened our front door and said “Go to Ceces!” Just the sound of her name got them barking and leaping for joy. They sprinted across the lawns, climbed the porch steps and barked until she answered the door. They hung out with her, licking her legs, getting spoiled and keeping her company. And when Jessica was born in 1994, Cece, and her daughter-in-law, Kathy, were the first visitors when I got home from the hospital. They didn’t even wait for us to get out of the car before they were walking across the yard. Jessica started going for visits as soon as she could walk. They watched cartoons and played cards. Cece kept a candy dish filled and when Jess got older, Cece would pay her a dollar to take out her trash. Cece came to Jessica’s First Communion. And she reminded us that we needed to take her to Mass every week. She came to every one of Jessica’s birthday parties. She loved Jessica like her own grandchild. Cece was family. When her grandson Brian moved nearby, he became like family too. Jessica would sit on his lap, play games with him and was honored to be the flower girl in his wedding. No doubt she had a crush on such a handsome young man. She loved crossword puzzles and sharing stories about being a young woman, wartime and the fly boys, dating, getting married, being a young mother, having miscarriages. Cece could be a cantankerous woman sometimes—she didn’t take any crap from anyone for sure, but I could always count on her to empathize with me when I had a sick husband/child (pretty much the same thing :)) or when I went through some of the toughest times of my life—miscarrying two babies. Cece had miscarried two babies as well. And she said the pain never really went away. She had one child and I had one child. Cece and I had a lot of common in that respect. Special people deserve their very own SoulCollage® card in my collection and Cece was a very special person to Joe, Jessica and me. I’ve been thinking about and missing her and her family a lot lately. I had a dream about Cece a few weeks ago. I was visiting Maira (our foreign exchange student who came to us the same day as Cece’s funeral) in Argentina. And Cece came to see me there. When I saw her she was so beautiful. She looked like herself, but glowing with an-other-worldly-exuberant-joy-and-peace. She gave me the biggest, most heart-felt, comforting hug I’ve ever received. And that was it. What a comfort to have her visit in a dream…and such a gift. Cece lives on in our memories, our stories…hardly a week goes by when her name isn’t mentioned. I walk by her table, my altar, every day. (Read Altars: A Sacred Space.) It’s been 8 years since Cece passed away but she lives in our hearts. And based on my dream, she isn’t just resting in peace, she is filled with joy. Thank you for writing something so beautiful about my grandma.